Brad Young is a global content strategy leader for Dun and Bradstreet, leading the creation, curation, and editorial coordination of world-class, modern content and content experiences for customers, sales teams, partners, alliances and influencers. He also has 17 years of content and marketing experience, making him a leader in content strategy marketing! Brad recently joined AMP UP Your Social Media’s host Glenn Gaudet to discuss the significance of content marketing and strategy. Become a powerful storyteller. When you have the mentality, metabolism, and mindset, you have an incredible opportunity to reach the most people in an engaging, revenue-driving way. Use modern technology. Your story is only as good as who it reaches. Don’t be afraid of utilizing modern technology and social media to get your content into the hands of the most people possible. Use data to advance relationships. Your raw data can have stories built around them, and use this data to move your company forward. Content marketing needs to be useful. Don’t make it all about you! Your content should be designed around the lifestyle of your target audience, and you don’t have to be promotional to sell your product. Story first, media second. Mine your content for all it’s worth, and create content calendars to drive your story forward. It may be appropriate in some instances to outsource your videos to other companies so you can focus on your story! Brad would love to hear from you! Chat with him on Twitter or connect with him on LinkedIn. Brad is married to a wonderful wife and is the father of two daughters. He’s a positive thinker and progressive leader with a degree in journalism from Penn State University. He currently calls New Jersey home and roots for the Phillies in baseball and, of course, Penn State in football! Gary Lipkowitz, Chief Operating Officer of GoAnimate, works with video and animation creation. Evangelizing cloud-based video, his goal is to grow your business! He specializes in content creation, financing, and international distribution. 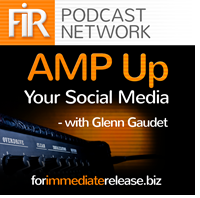 Gary recently joined AMP UP Your Social Media’s host Glenn Gaudet to discuss social media, content marketing, and your business. Have a public relationship with your customers all the time. In fact, that’s what social media is! It’s a way to market yourself in a public forum on a constant basis, reaching customers continually. Be transparent and be honest! Embrace video. You knew this was coming! I’ve been around video my whole life, and I have always known that everyone wants to use more video. If we had the resources to do so, we’d all have television advertisements. With social media, we can utilize video and market to customers by using social media platforms. Plan videos and create professional videos. Keep a journal of ideas, because it’s hard to be creative under pressure. Whatever you respond best to is what you’ll have the most success with when developing video. Create a story, and keep your brand values in the back of your mind. Your brand is a promise. That promise is now told in story-form, and that could be done through video. Keep the origin story in mind as well as your vision, and keep your brand’s promise as your primary thrust. Communicate your origin and your values for maximum effectiveness. Gary would love to hear from you! Chat with him on Twitter or connect with him on LinkedIn. An INSEAD and NY University alum, Gary has years of experience and education leading to his expertise in video creation and content distribution. He’s a lover of both hockey and reggae and enjoys the art of storytelling and public speaking. Tara Zoumer is the PR coordinator and Social Media Manager for TriNet, a cloud-based HR management partner. From cupcakes to Alzheimer’s care, Tara has extensive experience in in-house PR and marketing. Tara stresses the importance of communication and enjoys the challenge of figuring out how to best communicate a message and making sure that it resonates with the intended audience. Tara recently joined AMP UP Your Social Media’s host Glenn Gaudet to discuss the importance of including your employees in your social media strategy. A Social Strategy. Whether you like it or not, the conversation about your company or product is happening online. You don’t have to participate in it, however the more you try to ignore it, you will find that you end up running into it anyway. Instead of ignoring it, you should embrace it. Social media offers a unique opportunity to be transparent and open and have a two-way conversation between your clients, your employees and the general public. Further, if you find that you have negative reviews, definitely do not ignore them. The most important thing that you can do is to respond to them. This shows that you care and that you pay attention to what is happening to your brand online. Employees on Social Media. Many companies worry that employees on social media may be a liability, but the benefits greatly outweigh the risks. The small amount of “rogue” employees who may be a liability on social media are worth dealing with because you are gaining so much more. Training and talking to your employees is huge, too few companies have a social media policy or training program. Establishing that is a very important step for any company. Create guidelines, policies and training for employee that clearly lay out the company do’s and don’ts for social media. Your goal is to make your employees familiar with what they can do on social media and help your employees feel confident and comfortable with sharing content on social media. Finding Success. A successful social media strategy should include a combination of content and messages; PR activity, news publication pieces, relevant marketing events, suggested content, industry relevant content, generic industry pieces and actions all help to keep your followers engaged, and employees eager to share. Further, listen to your employees. Find out who is active on social media and use them as internal ambassadors. Keep your social media approach with your employees simple; figure out what they will like and what they will actually use. Regardless of your company or your product, make your approach relevant and make sure you use the right tools. Tara would love to hear from you! Chat with her on Twitter! Based in the San Francisco Bay area, Tara Zoumer is the PR Coordinator and Social Media Manager at TriNet. With a BA in Communication from Chapman University, Tara uses her passion as a communicator to help individuals, companies and brands create and communicate their messages. From traditional PR campaigns to social media to guerilla marketing, Tara feels that advertising, marketing, PR and social media should be blended together to create a cohesive and powerful communication arsenal. A PR Coordinator and Social Media Manager by trade, Tara is also passionate about cooking, and even works as a chef on occasion, and is an avid traveler. Mic Adam is an online and offline networker specializing in social media marketing with 30 years of experience. His goal is to bridge the gap between social media and business by utilizing B2B and B2C sales and marketing, using his years of general management experience as a springboard. He thrives on the passion that drives sales and profits by demonstrating and diversifying the unique selling points of high quality products and services through traditional channels as well as new media. Mic recently joined AMP UP Your Social Media’s host Glenn Gaudet to discuss social media policy creation and how you can get your employees on board with social media! Use your employees as ambassadors. Your employees are your greatest asset, as they (hopefully) support your business and have the ability to reach customers that you may otherwise not have had access to! Lasso those employees and utilize their networks to support and socially advertise for your business. Users tend to take individuals’ posts as more authentic than those from a business, so your employees can be your ambassadors and will typically gain more traction in the social media world. Don’t be restrictive. Rather than limiting access and implementing ‘negative’ rules, encourage employee interactivity! Enforce simple and clear-cut policy rules that are fair and follow a standard code-of-conduct. Fortunately, most companies already have guidelines established, so simply enlarge that policy to encourage employees to be responsible when using social media. Look at the verbiage of your policy - how many cannot’s do you have? Change the perception of your policy by encouraging people to speak out and speak up. Have a good roll-out plan. Many companies don’t have a social media policy in place, so implementing a policy can be a shock if done at once. Rather than being reactive during a damaging situation, roll-out a well-organized policy over time - preferably not during a time when your marketers are doing any damage control! Design the roll-out with presentations to show and guide employees through the changes while learning about the policy and social media in general. Protect your reputation. In many cases, people forget that the individuals that comprise the company, those personal conversations can have an impact on the company as a whole. Design your policy to encourage interactivity from employees on social media while protecting your reputation. Write simple and solid restrictions on what can and cannot be discussed by employees on social media websites. Mic would love to hear from you! Chat with him on Twitter or follow his blog. A father and entrepreneur, Mic Adam hails from Brugge, Belgium. He enjoys basketball, bicycling, and the outdoors and is fluent in both English and Dutch as native languages! He also spends his time volunteering with the Al-Anon Family Group Headquarters and publishes in De Tijd in Belgium. Mark H. Cohen is a traditional marketer, boasting a history in marketing in the early 90s. Since then, he’s started his own agency called Colloquy Digital, LLC and focuses on digital strategy, planning, production and integrated marketing services. Mark recently joined AMP UP Your Social Media’s host Glenn Gaudet to discuss digital strategy and execution and its integration with your business! 1. Regulate speech on social media. Many times companies work within a regulated environment and are unsure of how to bridge that gap into social media. Apply the same principals you’d use for non-social internet pages and emails to social media as well. The lines are still blurred, so it’s ultimately left up to compliance officers and legal teams depending on the industry. While interpretation is left to them, finding a balance between playing it safe and stepping outside the box. 2. Don’t forget disclosures. Use the right disclosures to share content that you’d otherwise be too cautious to share to get to the heart of the content. Get involved with content curation; As long as you’re not endorsing the content and use a disclosure. You can share great content about what you support without breaching regulation. 3. Utilize your Twitter background. 140 characters is many times not enough space to get your point across, especially when you are adding a disclosure to your content. Instead, put your disclosure in the background of your Twitter profile as a cure-all for any content you post. This way you aren’t using precious space in your feed while still following regulation! 4. Support employee engagement. Many times, employees are looking to post individual content for the organization, and the result is a genuine post! Foster employee development while training them on disclosures. Content curation can be difficult, and individual employee content can be a wealth of internal brand marketing voice! Mark would love to hear from you! Chat with him on Twitter. A native New Yorker and father of three, Mark is both a family man and business professional. He focuses his spare time on giving back to the community and is a board member of several organizations. A self-professed bourbon connoisseur and lover of ethnic food, music, and the outdoors, Mark is both down-to-earth and other-wordly!